Immensely appealing and alluringly spicy, Cuban food has exploded in popularity. Recently, many Nuevo Latino chefs have chosen to interpret it in various fusion dishes, but the real home cooking of Cuna is delicious and rewarding on its own. Discover in a new cookbook which not only explores the riches of the cuiisine but also reveals the unique beauty of Cuba itself. Influenced by the diversity of cultures that have settled on this Caribbean island over the centuries, including Spanish, French, African, Arabic, Chinese, and Portuguese, true Cuban cooking is exciting and varied. From such festive finger foods as croquetas, pastelitos, and bocaditos to traditional entrees like arroz con pollo, picadillo, and bistec emanizado, there's a wealth of savory dishes to explore. Learn how to create the traditional medianoche, or Cuban sandwich, brew a cup of bracing cafe cubano, and make the sumptuous dessert known as dulce de leche. 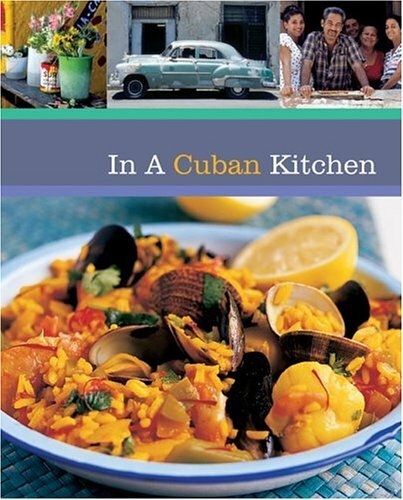 In addition to the treasury of 1oo traditional recipes, compiled by an accomplished Cuban-born chef, In a Cuban Kitchen provides a fascinating look at sugar cultivation, rum production, and other native resources essential to Cuban cuisine.